This is a story about art. 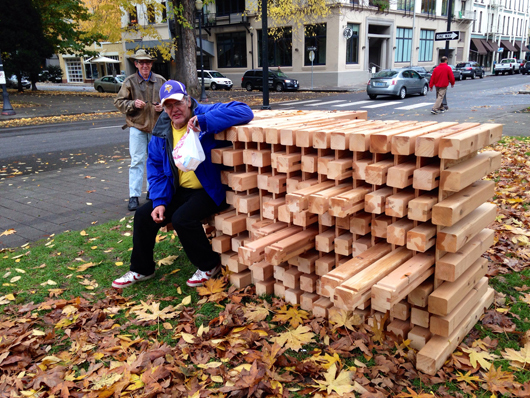 About public art — a public installation of grand, yet grounded proportions. It is a story of architecture. Of science and of history. Of a way of looking at an environment and a landscape with a poetic understanding. Of blending inspiration, appreciation, and idea with the realities of weather, structure, and observation and of seeing grace and beauty in the forgotten and the abandoned– in a cityscape of low-profile commercialism, traffic rushing to destinations elsewhere, and the utilitarian harshness of streets dominated by warehousing. It is also about what is left when something is gone as a place evolves through time. And it is about connecting to people, their sense of place and their capacity for appreciation. 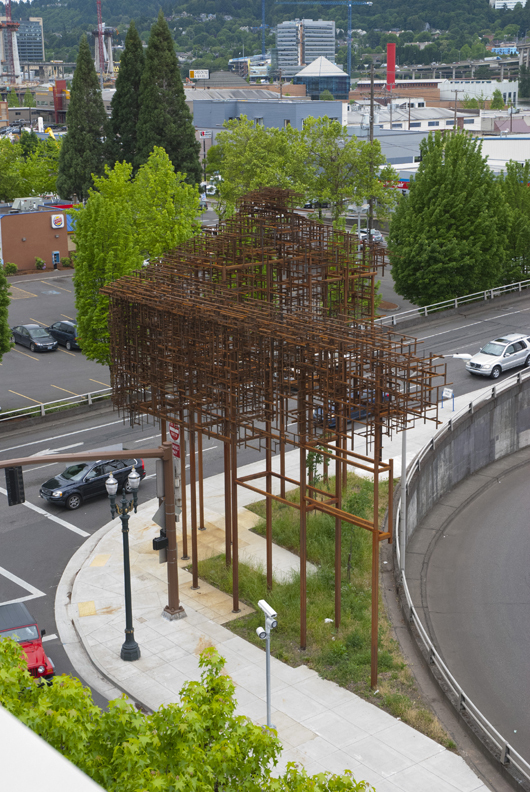 It is about Inversion: Plus Minus, the filigree-like corten steel structures that now rise up to define the eastern finishing point of Portland’s Hawthorne Bridge. 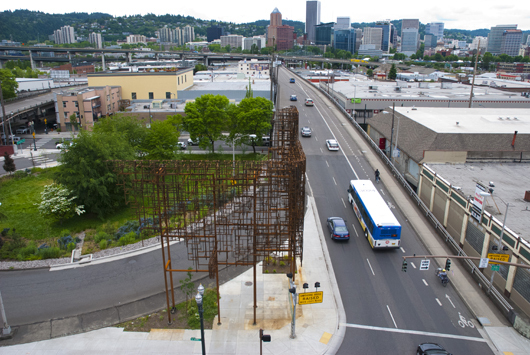 Conceived of, designed, and built by Seattle-based Lead Pencil Studio’s artist-architects, Annie Han and Daniel Mihalyo (both are UO Department of Architecture alumni), the installation is a public art project administered by the Regional Arts and Culture Council and part of the city’s 2% for Art ordinance and Portland Streetcar’s expansion to the central eastside.. 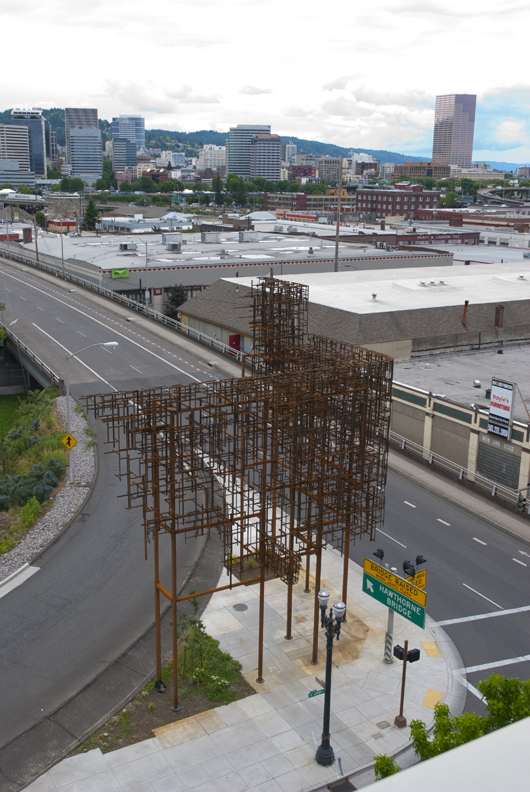 Selected by a RACC-assembled public art panel in 2011, Lead Pencil Studio’s Han and Mihalyo saw the pre-Inversion: Plus Minus Hawthorne Bridge location as a “ruthless pedestrian environment” immersed in a region of “old billboard structures, warehouses, and a density of commercial [buildings]” that had defined and shaped the area for over a century. 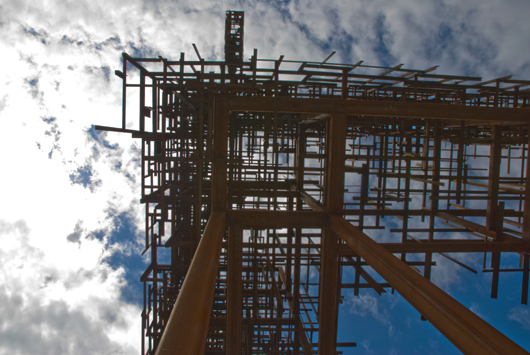 Han and Mihalyo visualized the environment as predisposed to inspiration they derived from shipyard-scaffolding, and a poignant sense of industry left behind once the production was completed. 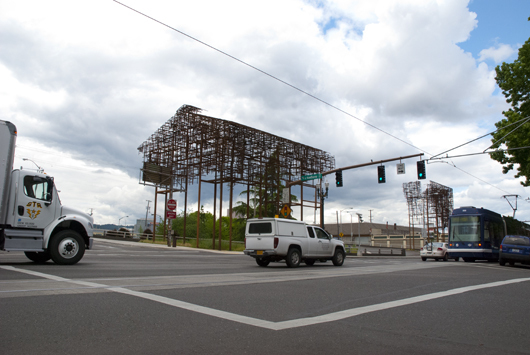 The actual physical east Portland location, imagined from an historic perspective and from a vision that acknowledged a past of industrial and commercial ebb and flow, gave the artist-architect team the sense that “it had a life already” and that life required expression and appreciation. Thus, Inversion: Plus Minus can be said to provide a glimpse of what had existed, and a reference to a past, of buildings that once stood in this place with rooflines discernable in the silhouettes of Inversion: Plus Minus. 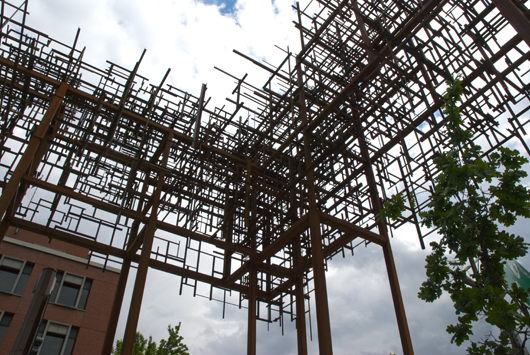 By presenting the idea as a void or a shadow of a building, not solid, but permeable, with the wind and the rain having full access, this tumbleweed-like aesthetic gives viewers an opportunity to imagine and to “capture a sky, a volume, a gesture, and to give one an experience,” describes Han. Both Han and Mihalyo confide that it is futile to try and control the meaning of their work: “providing a narrative—confines the work too much.” Their goal, they say, is for the individual to “come to their own conclusions: it is more meaningful that way.” And while the quizzical form of the installation, its spiny composition of right-angle welded small pieces, from afar appearing digital in form, pixelesque in repetition fascinates the eye, Han and Mihalyo point to the questions it might raise and the discussions it might precipitate as being the most important. Inversion: Plus Minus succeeds in capturing a void, a series of spaces otherwise lost in the ethereal upper stories atmosphere blanketing a busy streetscape. The structure frames a memory bringing recognition to a history and a concept of all things existing, somehow connected to our present and bridging that gap between emptiness and purpose. 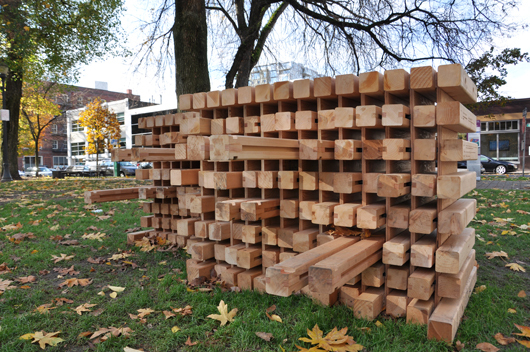 By recreating the edges of the former industrial buildings, the art piece pays homage to ordinary workers’ lives. The anonymity of the building forms speaks about the dignity of common person’s mundane existence. The composition of metal strips recalls the static of a not-quite-in-tune television set, evoking the ephemeral quality of a dream. The disciplined orthogonal order creates a random weave texture that reveals the contemporary origin of the artpiece. Because these members catch the light in different ways, the appearance of the piece changes according to the lighting condition and viewing angle. I first saw the piece in silhouette, which muted its spatial characteristics. Photos show how that direct sunlight brings out the more literal architectural features, and reveals a rich depth of layering. Years ago, Portlanders passed by, worked in, and interacted with structures at the Hawthorne Bridge | Grand Avenue location that resembled the roofline and height of Inversion: Plus Minus. From the 1930s-1950s, businesses bustled and people came and went in a dense urban environment. Prosperity eventually waned and the area shifted focus transitioning to a much more car-oriented comfort level. Buildings once here disappeared: torn down, removed, simply altered to fit a new aesthetic, different requirements, and modern commercialism. The environment morphed, materialistic things came and went, replaced by new buildings, new business, new people. A sense of curiosity remains, however, with a love of a place, aren’t we compelled to wonder what happened to what was before, after all, did it not influence our present and effect our future? Does it simply disappear? Seeking to explain or justify or even just satisfy a sort of questioning of the past in a way reminiscent of Roman poet and philosopher Titus Lucretius Carus’ epic poem, On the Nature of Things, who writes “all things flow –the things thus grow.” It is an approach that fits rather well with Lead Pencil Studio’s ideology. The original structures are long gone, disunited, but what remains or has replaced the emptiness is represented with affection and a weathered rust-orange patina of nostalgia that has become evocatively representational. Han comments that Inversion: Plus Minus sought to “repair the fabric of the city;” and that the desire was “to let Inversion: Plus Minus exist as a reference point similar in size to buildings that were here historically.” Lead Pencil Studio’s installation reaches into the skyline in an attempt “to relate to the city and the scale of the city, to walk between the presence and the absence….” says Han. It stands as a series of right angle outlines that forge a description of history, and summon a memory. The idea of this public art installation as a work of memory, a piece meant to acknowledge something that existed in our past is captivating. 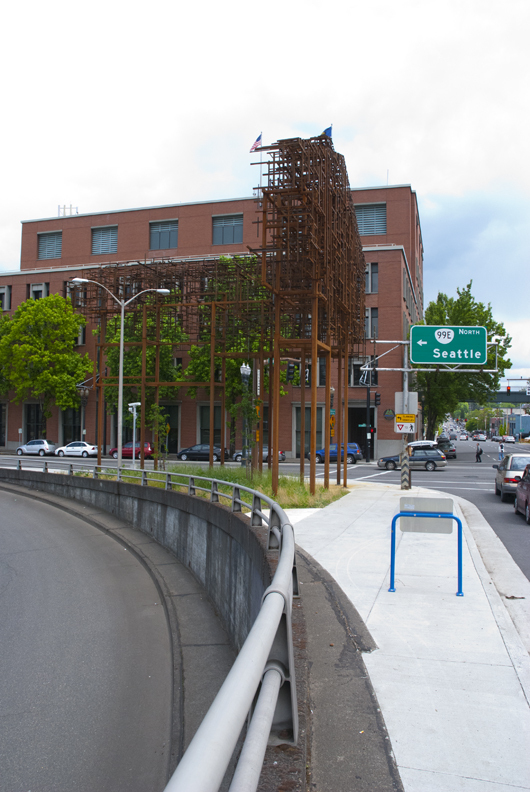 But as a piece of public art, how does it function? What does it bring to our community? 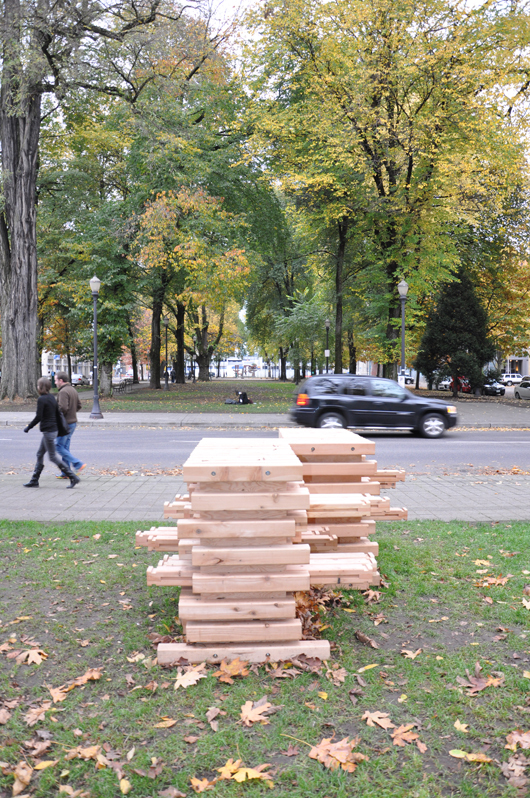 I set out recently to gather concentrated community responses to this work from the public as I felt that would help to anchor Inversion: Plus Minus to the community and foster a dialogue that accepted the piece as permanent piece of our landscape. I decided to begin at the beginning: with the people who were watching the installation in situ from the get-go, and would be looking at it daily for a very long time. 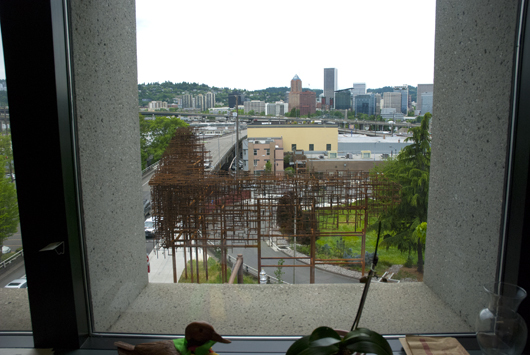 What I came across were some wonderful surprises and a delightful treasure, Lynette Hanson; her co-worker Steve Wright (both employees with the Multnomah County Sheriff’s Office); and the west-facing office window-side employees of the Multnomah County Information Technology offices. Hanson works on the third floor of the Multnomah Building in the Multnomah County Sheriff’s Office. Across the street, her office window looks directly towards Inversion: Plus Minus. She has no formal art or architecture background, and works as an office administrator. 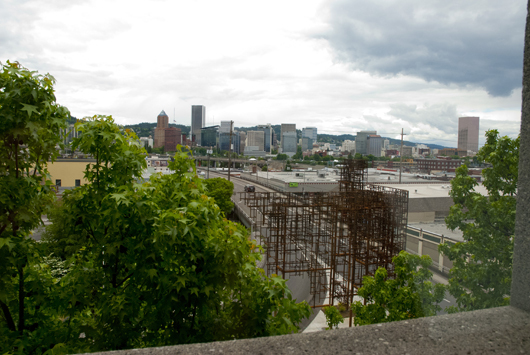 She does have an enthusiastic love of photography, and an appreciation for all things Portland. The reflections of Hanson express appreciation and a realization that this piece of public art enhances the community. It was a sentiment I would begin to hear over and over as I pressed on and asked for more input from the Inversion: Plus Minus’ captive audience at the Multnomah Building. Sheriff’s Office worker, Diane Hutchinson was happy to show me “the best view in the building”—she unlocked the main conference room so I could get a pristine look at Inversion: Plus Minus—the view seen by some of the sheriff’s office most important officials: third floor, west-facing full fenestration eye-level view of Inversion: Plus Minus. 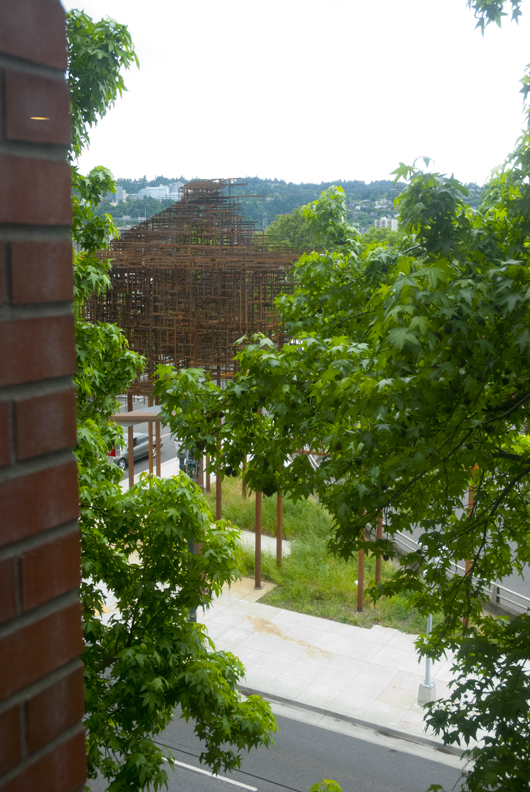 Across the street—turned out to be an excellent vantage point to a much better impression of the connectedness of the components, and the maze-like quality of the fused steel. Hutchinson’s co-workers were equally enthusiastic. Steve Wright, the Sheriff’s Office representative to the Multnomah County Green Team, among other things, proudly and graciously took me up on the building’s blustery wildflower-planted ecorooftop to be able to photograph and look at Inversion: Plus Minus from “a different angle.” He spoke with reverence and a sense of pride for being in such close proximity to the structure and even commented on looking forward to seeing how it might be used by all “neighbors” (birds, included) as it assimilates the regional ecology. I was consistently and pleasantly surprised by the willingness of all to show me their “view” as my “tour” continued on the upper floors of the Multnomah building–employees eagerly walking me over to share their window views (Stan Mason and Tim Kurilo) and encouraging me to photograph varying angles of the structures framed by office cubbies and window sils. 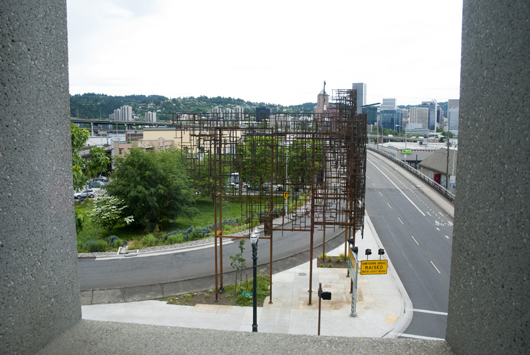 We have all become rather accustomed to seeing this installation from a street view, and there is really much more to to be discovered, especially with how this installation contributes to the Portland skyline. 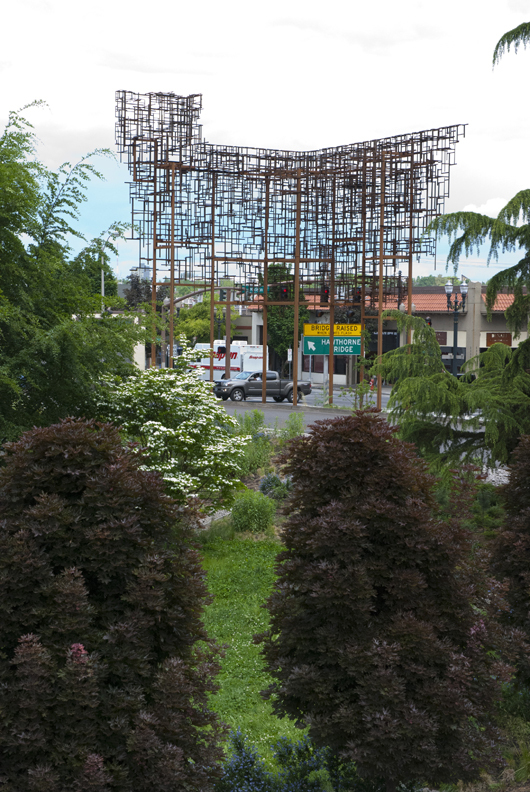 Obviously, these 50’ high structures of 12 tons of steel are growing on their public audience and branching out to connect with the community. This is not a new progression for how the work of Lead Pencil Studio is perceived. 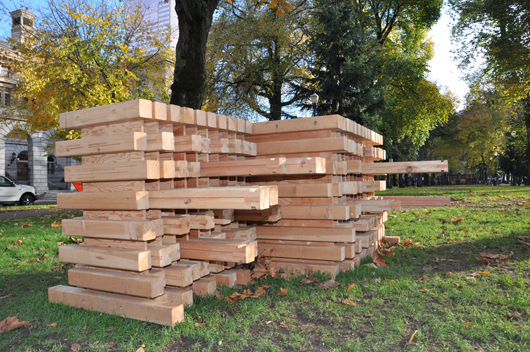 Beth Sellars, curator of Suyama Space in Seattle (a place where work by Lead Pencil Studio has been exhibited) comments that whenever Lead Pencil completes a major art project, it is certain to be thoughtful, sensitive, and smart and will resonate with the public to the point of prideful ownership. As a curator with a long history of their work, I am constantly intrigued with their inventive approach to large scale projects. 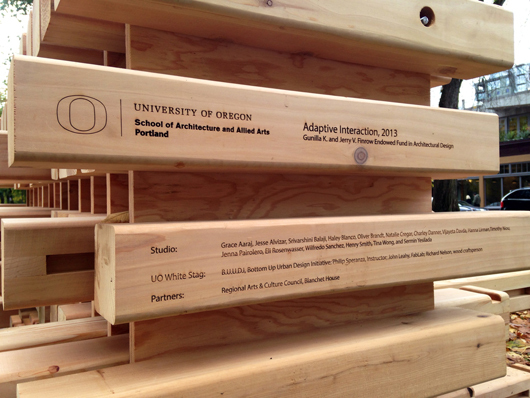 Their Inversion: Plus Minus promises to be their most innovative to date and I’m envious Portland will be the home for it…. Lead Pencil Studio’s thoughtful reminder of the disappearing history of the industrial East Portland neighborhood, the actual 1900’s iron foundry that was destroyed to make way for bridge construction, and the mindless stream of vehicular traffic separating the neighborhood from the rest of the city will coalesce in community-wide pride of place once the work is completed and embraced. And indeed, embraced it will be. [Projects like Inversion: Plus Minus] contribute by the fact that their conception grew out of local/regional history and knowledge. I believe that anything that responds to – and contributes to – our unique environment and sense of place helps deepen our identity. That said, I am personally not fond of many of the public art pieces that have been done because I don’t feel that they contribute in a positive way. But this is the age-old conundrum…beauty and meaning is in the eye of the beholder. 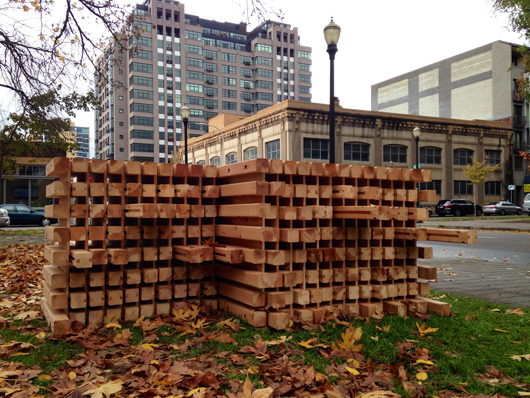 I do appreciate the use of permanent materials and the sense of quality in “Inversion”; from my perspective, those are two required characteristics for the success of public art. ….intellectual integrity and curiosity [of Annie Han and Daniel Mihalyo] has kindled a passionate debate, a volatile context in which to address the interdisciplinary overlap of architecture and site-specific art. However, while politics may be a condition for the work, it’s not the subject tonight…that’s the art and the artists. 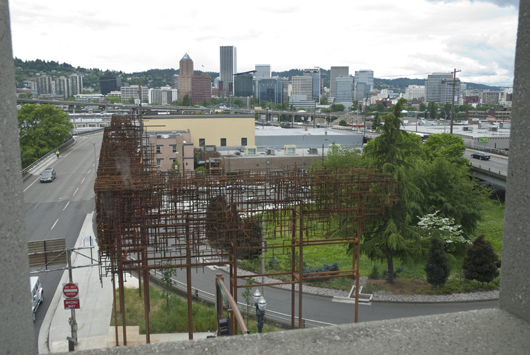 Portland and Multnomah County’s Public Art Programs have been in place for 33 years, so the collections represent many different phases of our region’s growth through the eyes of artists working in many media and taking widely diverse points of view. They also represent the critical work of countless selection panels members who are artists, architects, bureau people, neighborhood representatives, citizens who care deeply about building the art component of this remarkable place. 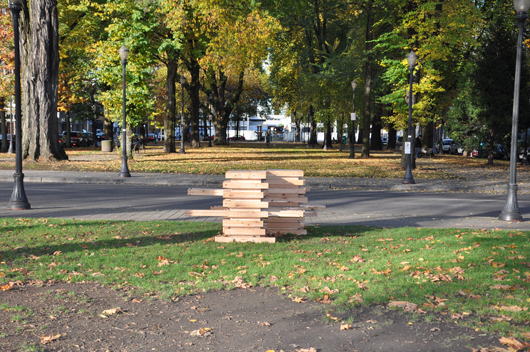 It is hard to image Portland without its public art. It’s in the streets and sidewalks, inside and outside public buildings, parks, fire and police stations, libraries, clinics, transit lines and courthouses. 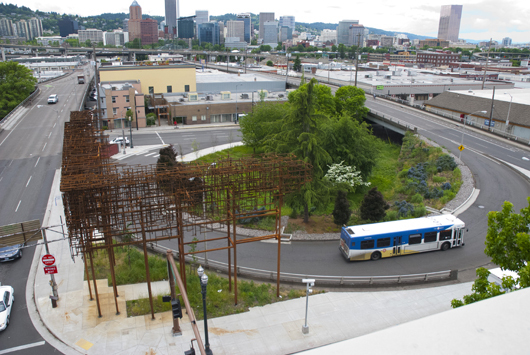 Inversion:Plus Minus is the result of the selection panel, created specifically for the eastside streetcar line, deciding that the near eastside deserved major, large scale artworks. The selected artists (Lead Pencil Studio) were inspired to bridge a modern commitment to connect east and west sides of the river with a new streetcar line and the area’s industrial past. This piece (currently half finished) is both bold in scale and ambition and poetic in its abstracted reference to buildings once in those places. They surprise and in some cases startle passersby. 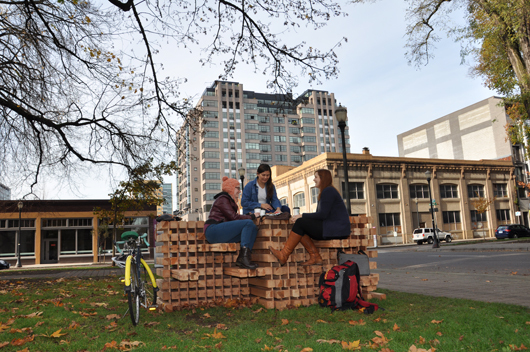 They promote curiosity and dialogue, which is part of why public art is important in our city. One thing is certain, Inversion: Plus Minus offers to its viewers an opportunity to envision scale, experience material, and explore light, space and height in a purely public forum. It seems to suggest a deeper understanding of our universe to those considerate of the philosophical wanderings of ancient thought and scientific inquiry. If we are to wonder, “things are their quality, things are their form” as Carus’ moving On the Nature of Things encourages us, with Inversion: Plus Minus we are given a beautiful concept, and one that evokes a sense of permanence and foreverness despite a physical disappearance. Science teaches us that nothing is ever created nor destroyed, that atoms and molecules never disappear but continue on within our universe, becoming our environment, being incorporated into a system of nature and being, the ultimate in sustainability. It is a scientifically-based concept that enthralled the thinkers of ancient times and is expressed so eloquently in On the Nature of Things. Taking Annie Han’s and Daniel Mihalyo’s reposeful poetic way of offering that we relate to the city, and to the scale of our city; that we “walk the line between presence and absence,” and notice that which has disappeared, I will leave you with an excerpt from Carus’ On the Nature of Things, realizing that “all things flow….” and, in its purest form, Inversion: Plus Minus might compel us to think about and discuss the transitory nature of our environs, the concept of sustainability, and, simply, the nature of things…. And certainly anything that encourages thought, is a good thing. Shalt go. Thou art going, hour by hour, like these. And Babylon is a memory and a mound. It was the dust, the sunshine and the rain. The flame was once the fragment of a star. So die the qualities without the thing. So with the body one thing is the soul. Were no such things as taste and sound and sight. Naked and bleating on the shores of light? What is it there? A cry is all it is. It knows not if its limbs be yours or his. Less than that cry the babe was yesterday. The man tomorrow shall be less than this. As leaf by leaf the rose becomes the rose. Goes from the bubbles when they burst, he goes. Outlasts its wave, each wave outlasts the sea.